Last week I went really broad. I was even emoting. I know right? Feelings are so 2010. Let's have a bit of a pallet cleanser this week by contrasting last week's broad post with one that is about as narrow as it can get. One rule structure. One Pokemon. Come with me as I dive right in to the delicious, sweet, creamy taste of Vanilluxe. Yum. Chapter 2: Tailwind, Or: Am I the Only One that Doesn't Think Whimsicott Looks like a "Prankster?" Tailwind/Prankster is one of the two most common strategies in this year's VGC. Either Whimsicott or Tornadus will set up the move "Tailwind," which for four turns doubles the speed of all of your Pokemon. Those two Pokemon are able to do this because of their ability "Prankster," which makes non-damaging moves have an increased priority of +1. This helps out Vanilluxe immensely, because he goes from being slower than most competitive Pokemon to faster than almost all of them. In this scenario he can use Ice Gem + Blizzard to do serious damage to an opponent's team. As I mentioned earlier, there are a lot of Pokemon that are weak to ice in VGC. You can use Blizzard as artillery, so to speak, and then have your second Pokemon clean up what Blizzard either didn't hit or couldn't finish off. 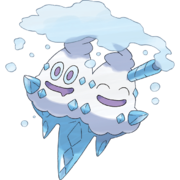 Under ordinary circumstances Ice Beam would be preferable if Hail were not a factor, but because this is a double battle, Blizzard is able to hit both. That 70% accuracy means you are almost always going to hit at least one, often hit both, and very rarely will you miss completely. Additionally, the double battle mechanic that reduces the power of moves that hit multiple opponents by 2/3 only puts Blizzard 5 base points below ice beam. More often than not you will hit both of your opponent's Pokemon, making it worth more than ice beam here, in my opinion. Ice Beam can still be handy if your opponent only has one Pokemon left and you want to make sure to hit it. I just spent too much time explaining why you should go with Blizzard instead of Ice Beam. I'm keeping it though. That second half of the last paragraph has become like a son to me. Sure, he's a little socially awkward and he doesn't play well with others, but I still love that little tangent. Ugh. I feel dirty writing this. VGC Trick Room teams are annoying. Super annoying. Like, having to sneeze but not being able to annoying. Don't say I didn't sacrifice anything to write you these articles. I sacrificed my pride by endorsing a cheap team like this. Wow. That took a turn. Anyway, Vanilluxe works on a Trick Room team because, as stated earlier, he's pretty slow. 0 EVs and a low IV stat in speed can make him a prime candidate for Trick Room. Because of his fragility it isn't recommended to lead with him, but once you've set up your Trick Room you can sweep with either Ice Beam or Blizzard. Preferably Blizzard. Look to the overly elongated tangent above. I find that using the moveset of Blizzard/Ice Beam/Taunt/Protect will pretty much work for all of these teams listed, but you can substitute in some more type coverage if you want, especially on a Goodstuffs team. I hope you enjoyed this article. I also hope you enjoyed the stream of consciousness shenanigans that occurred throughout. Perhaps I shouldn't write these at 1:30 AM. Or, if you liked it, perhaps I should do it all of the time. My tired body is against that idea however. Goodnight, internet. PS: My apologies to David, because I probably stepped into a bit of his Pokemon of the Week territory by writing about only one Pokemon. Also: Check out thepkmnplace.webs.com . A fan of ours started it and it's pretty fantabulous.